We are happy to share with you a very dear story of ours. When Mr. Demott visited Manhattan Orthopedic Care for a consultation for rotator cuff surgery with Dr. Armin Tehrany, we were immediately charmed by his positive spirit and charismatic nature. Even though he was in pain because of his rotator cuff injury, he was very pleasant and friendly, which made us like him even more. 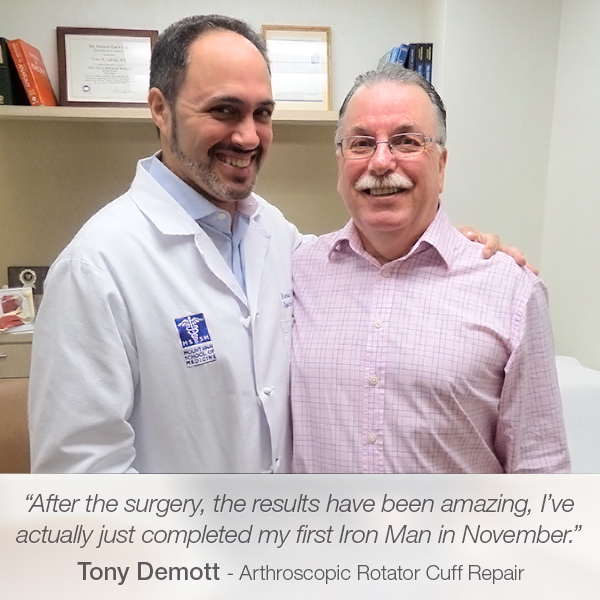 After Dr. Tehrany diagnosed him, he was scheduled for a rotator cuff surgery. The arthroscopic rotator cuff repair went smoothly, his recovery process went without a hitch as well, and Mr. Demott is now fully energized and back on track with all of his physical activities. My name is Tony Demott and the reason I’m here today is that I came in to thank Dr. Tehrany for his help. Several years ago he had helped me with rotator cuff surgery and since then results have been nothing less than amazing, so much that I’ve actually just completed my first Iron Man in November and I’m going to do another one this coming November. The Iron Man consists of 2.4 miles swim, 112-mile bike ride and then followed by a marathon, all within 17 hours. When I started training I really didn’t know how the shoulder was going to hold up and I can say with all honesty not only did it do well, but actually it was the best part of my body and held up better than other joints, whether be the shoulder, knees, elbows or anything. If anyone is even considering surgery for rotator cuff or any other things that Dr. Terhany specializes in, I can tell you without hesitation that Dr. Tehrany is definitely the surgeon that you need to talk to.